Researchers from Slovak Medical University recently published a study in PLoS One regarding the possible connection between formula feeding and reduced insulin sensitivity. Formula used in the study was described as advanced glycation end (AGE). AGE diets are known to affect the body’s sensitivity to insulin. Term infants between the ages of three months and 14 months were included in the study; a total of 166 infants in all. 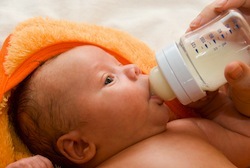 The infants were placed in groups based on feeding method – formula versus breast milk. Conclusion: Researchers didn’t find a statistically significant difference between the two groups in terms of insulin sensitivity. Researchers do not believe there is an association between feeding method and insulin sensitivity in infant stages, but early childhood diets could result in a different outcome. Source: Klenovics KS, Boor P, Somoza V, Celec P, Fogliano V, Sebeková K. Advanced glycation end products in infant formulas do not contribute to insulin resistance associated with their consumption. PLoS One. 2013;8(1):e53056. doi: 10.1371/journal.pone.0053056. Epub 2013 Jan 2.